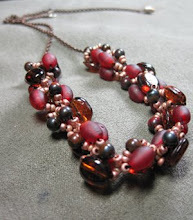 I signed up for the 6th Bead Soup Blog Party back at the beginning of the summer just before I went on vacation. I received a beautiful package of beads form my partner, Noemi Baena (fuego, metal, y color) that involves a lot of different pieces that I'm not used to working with. There's a lot more metal beads and the focal is an enameled bead in a shape I have never worked with before. I'm excited as that's what I like about this blog hop, the challenge of working with materials that I am not used to. I'm hoping that I sent her an assortment that is challenging and interesting as well. Stay tuned for a reveal of what I create on August 25th. Meanwhile, why not visit some of the other participants? One group is revealing this Saturday. The participants list can be found here on Lori Anderson, the fabulous hostess' blog.